7409 at North Freedom, October 1994. Kodachrome 35mm slide, Paul Swanson photo. #7409 at North Freedom, October 1994. Kodachrome 35mm slide, Paul Swanson photo. #7409 was completed by the Pullman Co. in December 1915 as part of an order for five identical open-platform steel combination cars (numbered 7407-7411) for the Chicago & North Western Railway. 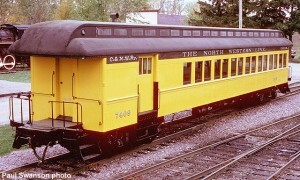 They were the last open-platform coaches purchased by the C&NW, and were intended for smoker use in commuter service out of Chicago, Illinois. Before the advent of air conditioning in the 1920’s when air ventilation was only available while the train was in motion, railroads attempted to segregate smokers from non-smoking passengers with their own room(s) in lounge cars, a separated section of a coach, or (in the C&NW’s commuter case), their own separate car. #7409 was designated as such, and outfitted with more durable Rattan seat cushions. Perhaps the specification of open platforms was an additional attempt to promote air flow through a car–the closed vestibule had been preferred as an advocate for safety for at least a decade prior to #7409’s construction. 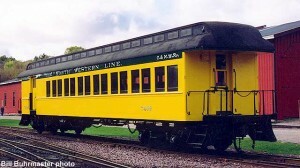 #7409 and her sisters were delivered in C&NW’s then standard yellow and green paint scheme. The cars’ interiors were finished in oak with cream-color steel ceilings, gas lighting, and a Vapor heating system (the car had its own coal-fired heater). In 1922-23, all five cars received similar improvements: used cup receptacles, full-length emergency brake cords, and safety chains for the side doors. In the next shopping in 1928 or 1929, the cars were repainted into a simple solid Pullman green exterior paint scheme. 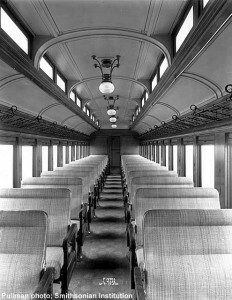 Sometime during the 1920’s, one seat was removed from each car, reducing the seating capacity to 58. 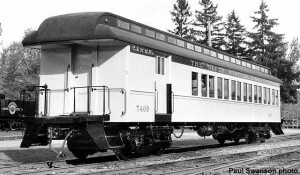 Between 1930 and 1933, the cars received their largest upgrade: strengthened end platforms, new cup holders, first aid kits, a new 2″ steam trainline for heating, stretchers and boxes for them, hose racks, and new-style weather stripping for the window sash. From this point on, the cars gained individuality; one was remodeled to allow RPO service. In 1928, #7409 had received a similar modification where the coach compartment was divided with a partition into two sections: a 12-seat smoking section, and a 46-seat passenger section. Three of the five combines were scrapped by 1956. #7409 with her two sections was suited for branchline service where a minimum of seating capacity was needed. In the 1950’s #7409 was used in this type of service on the C&NW’s South Dakota lines. Sister car #7411 ended up at the National Railroad Museum in Green Bay. In 1962, #7409 was sold to the Empire State Railway Museum in New York State. 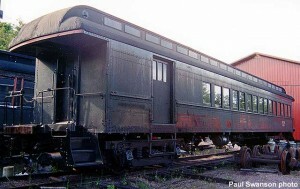 It was used in service on the Valley Railroad at Essex, Connecticut for many years. In 1990, the car was deemed surplus and put up for sale. Mid-Continent, seeking to increase the seating capacity for its own operation, as well as bring a native midwestern car back home, purchased #7409 in early 1990. 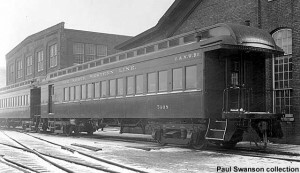 The car was shipped on its own wheels from Connecticut and arrived in Wisconsin in time to participate in #1385-powered excursions on the Wisconsin & Calumet out of Mazomanie, Wisconsin. The car was then delivered to North Freedom behind #1385 upon her return to Mid- Continent. #7409’s many years of service were apparent after a thorough inspection. A substantial $50,000 refurbishment was completed within four years, largely from gifts and donations. Work included an all-new roof, new clerestory window sash (the old ones had been plated over), replacement of steel sidesheets at the baggage end of the car, replacement of portions of the letterboard, all-new steps (treads were cast from new patterns fashioned after the original design), rebuilt trucks (including two new wheelsets), repair of the steam heat system (it had been damaged from freezing), and exterior painting to return the car to its as-built scheme of yellow and green. The interior will be restored as time and funds permit. #7409 is used during special events when additional seating capacity is needed.